Have you ever needed to print a large poster or banner but you couldn't make it big enough on your standard printer? PosterPrint can take a document created by any Windows printing application, zoom and print it for you on several standard sheets of paper using any available printer. Use your favorite program (MS Word, Corel Draw, Acrobat, Internet Explorer, etc.) to create or open a document, and print it to the PosterPrint virtual printer. Then easily zoom the document up to 1000% and print it on several sheets of paper on a physical printer! 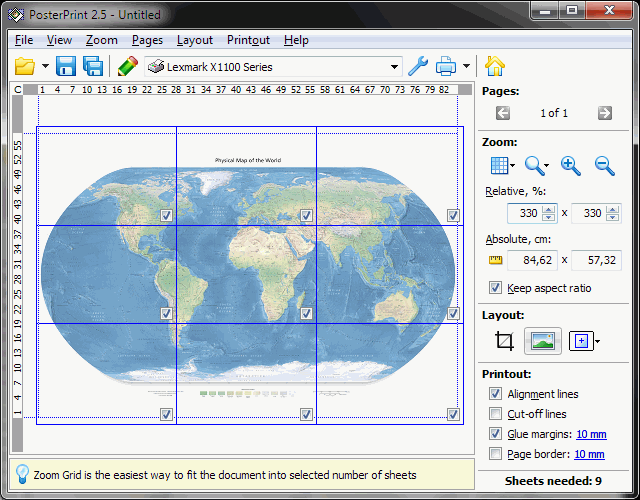 PosterPrint will automatically calculate the layout of your document for optimal paper usage. PosterPrint can trim out empty sheets, crop image area and add glue margins for easy sheet connection. Also, PosterPrint document can be exported to metafiles (*.emf) or saved to disk for later use or for printing on another computer.